Now that cooler weather is moving in, there’s not much I like better than to grab a cup of coffee and some cinnamon-yummy treat to start my day. This recipe is easy-peasy for a a weekend breakfast, or make ahead and warm up for those busy work-day mornings. 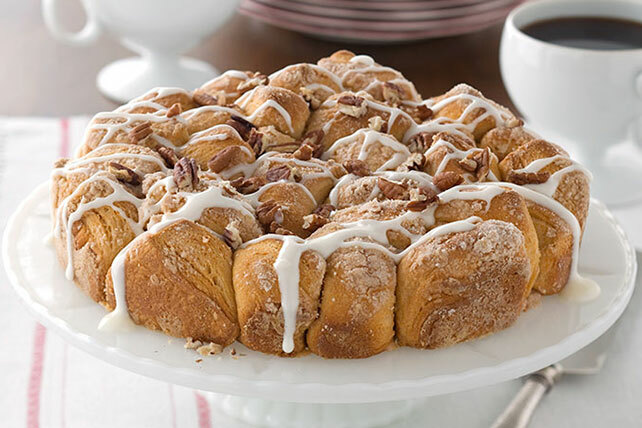 Drizzled with glaze and topped with toasted pecans, this pull-apart coffee cake looks like it came from a bakery. Wait until they find out you made it! This entry was posted in Writing Life and tagged coffee, family, food, links, recipe, Tuesday Treats. Bookmark the permalink.